Ever Wanted to Go to Church in a Bar? That’s one way that I’ve been inviting people to join Upper Room for Easter. Our 11am service this Sunday will actually be held next door to our current worship space. And by next door we mean at PD’s Pub. We’re doing this because we’re already running out of space at our current location. It’s a good problem to have. This past Sunday – with half-a-dozen of our core people gone – we had a full house. Anticipating more people for Easter, we decided to rent out the bar next door so that we have enough space. So, if you’re in Pittsburgh and have ever wanted to go to church in a bar, now’s your chance. Upper Room’s full holy week schedule is up on our website. In addition to the 11am service at PD’s on Sunday, we’ll have an early morning sunrise service of songs and scripture readings at 6:30 in Frick Park. Tomorrow night we’ll have a Maundy Thursday service at 7:00 at 5828 Forward, including a meal. And Friday we’ll join our partner churches House of Manna and Hot Metal Bridge for prayer in the streets of Homewood and an evening Good Friday service. At work at the cafe last week, I came across this five dollar bill. On it is written “opportunity / Kairos, / a time when conditions / are right for accomplish-/ed action / opportune / decisive moment.” Intriguing, right? And how peculiar that a bill with a theologically significant word scribbled on it would show up in the register at the cafe on a day when I’m working. In biblical Greek kairos means roughly what the definition scribbled on the bill says. It’s the right time, a special or fixed, perhaps destined time. It’s often roughly contrasted with chronos – chronological time – using kairos to describe God’s timing in contrast to our human sense of historical time. For example, it’s that opportune moment when someone was clearly orchestrated by God to put two people in the same place at the same time, or when an unforeseen but perfectly timed opportunity arises. 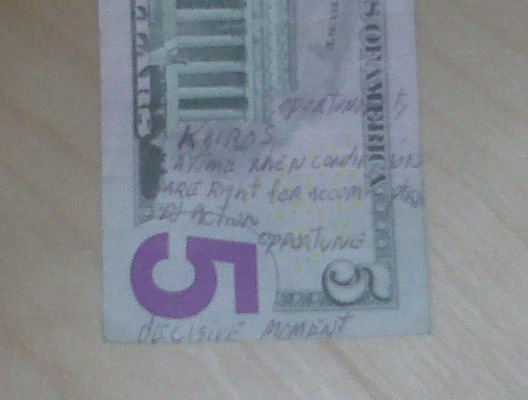 So, I was struck to see it showing up on a random five dollar bill at the cafe. To be honest, I couldn’t help but wonder if it was some sort of sign: “Eileen and I are trying to buy a house right now – does this mean it’s the right time to do so? Or does this mean it’s the opportune time to have a conversation with someone at the cafe? Or is the opportune time to . . .” My mind ran through all the possibilities I could think of before I realized how misguided some of my questions were. What I really needed was attentiveness, a watchfulness to discern when those moments are in front of me. Kairos is a beautiful concept, but there’s a problem: like my puzzled reaction to this bill, we normally don’t know how to notice the kairos moments in our lives. Like tuning a radio, we have to tune our hearts to be attentive to God’s Spirit in order to seize the kairos moments that come our way. How do we do that? I don’t know, because in truth, I’m not that good at it. But I have a hunch that it happens through prayer and worship. Last night, at our final ACFI seminar of the spring, we spent a little time talking about time. We had read the Apocalypse (the book of Revelation) and noticed the bizarre sense of time in the book. Past, present and future blur together throughout the vision. The book of Revelation certainly doesn’t operate according to chronological time. And I think that’s because it operates in a mode of worship. More than portraying any end-times events, the Apocalypse reveals the worship of God by the saints, angels, and martyrs in heaven. And in that setting, chronological time as we’re used to thinking of it makes no sense. I think that when we worship, we step into kairos time. We enter into a place where past, present, and future blur together as we at once recall God’s work in the world up to and through the cross and resurrection of Christ, and glimpse the future in the gathering together of God’s people around the table of messianic feast. Similarly, when we pray, we enter into a time apart from chronological time because we are communing with God. Perhaps it takes a heart that is grounded in prayer and worship to discern the moments when God shows up in our paths, the moments of kairos time. Perhaps that’s what I should pray for more than wondering why I came across that peculiar five dollar bill. Unlike the pagan religions which had stories of a god dying and rising again, the people who bore witness to the resurrection of Jesus were Jews. And faith in bodily resurrection was not at all unprecedented in Judaism: 1 Kings 17:17-24, 2 Kings 4:18-21,32-37, and 2 Kings 13:20-21 all tell of people being raised from the dead. Ezekiel’s vision of a valley of dry bones being raised to life, the Hallel psalms (113-118) which are used in the Passover seder, and numerous passages from the Prophets (such as Isaiah 26 and Hosea 6) speak of God’s power to raise the dead to life. In Jesus’ time the Pharisees were the great defenders of belief in general resurrection, the idea that at the end of time all people would resurrected. And the Apostles were schooled in belief in the resurrection; it was one place where Jesus clearly agreed with the rest of the Pharisees (Mt. 22:23-33). This leads Lapide to conclude “Only because they were Jews educated by the Pharisees was their conviction of resurrection the first step to their later Easter faith” (p. 65). Lapide then goes on to offer an analysis of the New Testament accounts of the resurrection which defend it as well as any Christian apologetic I’ve ever read: The fact that women are reported as the first to find the empty tomb, despite the fact that women’s testimony was considered invalid in those days, gives the story credibility. The content and language of Paul’s resurrection account in 1 Corinthians 15, which was passed on to him by the first witnesses, contain numerous un-Pauline phrases and a distinctively Hebrew style of writing, implying that Paul really is passing on in rough translation exactly what was passed on to him. Why then does Lapide not believe that Jesus was the Messiah? Because the Kingdom of God hasn’t come in its fullness yet. While Christians would say that the reign of God is already-but-not-yet present on earth, for Jews it is emphatically not. While the fathers of the Hebrew Bible and the prophets may have been expected to rise from the dead at the Messiah’s coming, the Messiah himself wasn’t necessarily expected to. He was expected to inaugurate the Kingdom of God on earth through an immediate restoration of Israel’s political independence. And that didn’t happen. Two ways of faith such as Judaism and Christianity, which ahve a common origin and hope for a common messianic goal, should devote their dialogue not only to the polite contact at the edges and to the removal of the tensions of the past, but should seek contact from center to center. Without glossing over or bypassing the differences, a dialogue in which both partners take the faith substance of the other as seriously as their own could become a true dialogue – from open faith to open faith, from confidence to confidence, from emphatic searching and finding, and from joy in the duality which knows its ultimate unity only in God. Tomorrow night at 7:00pm, Upper Room will get to participate in some such dialogue. Rabbi Alvin Berkun, Rabbi Emeritus at Squirrel Hill’s Tree of Life Congregation and a well-known leader in Jewish-Christian dialogue will be joining us to talk about current issues in Jewish-Christian relations. The subject matter may differ, but reading Lapide has me eagerly anticipating tomorrow’s discussion. Working toward my goal of doing more cross-cultural reading, I finally finished reading Divided By Faith last week. It’s an extensively researched account of the racial division in American churches, relating the history of racial division and analyzing current segregation. It’s very informative, especially if you like reading sociology. But the chief lesson I took away from the book boils down to this: whites and evangelicals are individualistic, therefore evangelicals who are white are hyper-individualistic. This leads white evangelicals to often suggest ineffective individualized approaches to racial problems. It’s not that white Christians have no racial conscience; no one in their right mind today would not say that racism is sin. According to the authors of Divided by Faith, it’s an issue of the “tools” we have to work with. Because we’re individualists, we use individual tools rather than corporate tools. As the title of chapter 6 – “Let’s Be Friends” – implies, the have-a-black-friend approach is much more popular among white evangelicals than the move-into-a-black-neighborhood approach. Developing a relationship with someone of another color makes sense to a mind that’s been taught a gospel of personal sin and personal salvation through personal relationship with a personal God. But the truth is that racism is not just an individual sin – it’s ingrained in our society, at institutional, political, and economic levels that must be addressed on a larger scale. Which raises the question, how do we find other, less-individualistic “tools” with which to approach racial division? Within the Church, though, the question becomes more how to we repent of our over-accomodation to American individualism and reclaim a more biblical sense of communal identity? Paul Louis Metzger, in Consuming Jesus, suggests that recovering the centrality of Word and Sacrament in churches will counter the consumerism in American churches today. In short, we should go to church not to experience the best praise band or the most dynamic preacher, but to encounter Jesus. We try to model this at Upper Room, with it being one reason why we celebrate the Lord’s Supper each week. But I think we also have to be aware of the message we preach: a personal relationship with God is good, but by no means is it meant to be private. The Bible is filled with images of community and communal redemption. We have to teach a holistic communal Gospel rather than an individualistic reduction of the Gospel. And I think – or at least hope – that we seek to teach this at Upper Room, as well. So, we’re trying. But we still have a long way to go. Sunday after church at Upper Room, a number of us went out to lunch at a nearby Chinese restaurant. I didn’t realize until Mike told me yesterday that all of the white people at the table had ordered individually while the three Asians had ordered family-style. It may be a relatively small cultural difference, but it reveals how much individualism is still ingrained in us. How else can the Church overcome individualism? What other tools can we use to create a more corporate sense of identity?